All Busby applications and services have the ability to write to the Busby Big Data service. This means a record can be kept of every workflow transition, alarm trigger etc. These records are stored in a Cassandra database. Cassandra is open source, reliable and designed to handle and store very large amounts of data efficiently. Cassandra can be easily clustered so your data is always kept safe. Busby Big Data has a simple user interface for performing pre-defined queries. This gives operational and engineering staff a quick and easy method to get metrics on demand for data such as the number of alarms, or the number of files processed in a day. Custom queries can be configured, and the Busby Metrics UI has the ability to export results to a CSV file for easy viewing or for further processing. A regular requirement of broadcast systems is to produce automated reports for SLA measurement, for example how many files delivered to a customer in one day. The Busby Big Data reporter can perform configured simple or complex queries on a timed basis, output these to a CSV or other format, and put it on a network share, FTP site, or configured e-mail address. Busby Big Data has a built in web data connector. 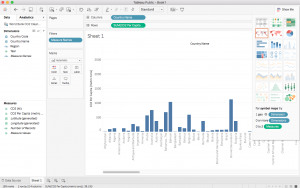 This can be used to view data held in the Big Data database in Tableau. This allows for a quick and easy way to perform one off queries, and display the results as a table, or in a chart/graph. This is especially useful when reporting on SLAs or looking for trends in data for example which days of the week are busiest for a particular transcoder.